The streets of Korea are wide and well paved. Bigger stores and familiar companies line those streets. If you’re seeking a pizza chain, or an ATM, or a taxi, that’s the place to go. And if you want to get a peek at the real character of the country, turn your gaze into the nearest alley. Oh, it may be narrow, but each has dozens of doors and behind every door is treasure for you to discover. Step right in. It probably isn’t dark and it’s certainly not scary. If you take that alley, the one in the center of the block, you’ll get to Hotel Nafore, where we’ve been passing the darkest hours in a room on the ninth floor. Yes, a tiny car might get to the hotel’s front door, but I haven’t seen it happen. Just to the left and right of the hotel is a crowd of one-story buildings divided into the smallest possible functional spaces. To the left is an independent convenience store the size of a walk-in closet and five plexiglass milling operations. To the right are a dozen tiny shops all selling trophies and corporate awards. That alley is a treasure of honor and achievement. An alley of drinking establishments and restaurants in Busan. Alleys similar to this are found in every major South Korean City. Click the photo to enlarge. 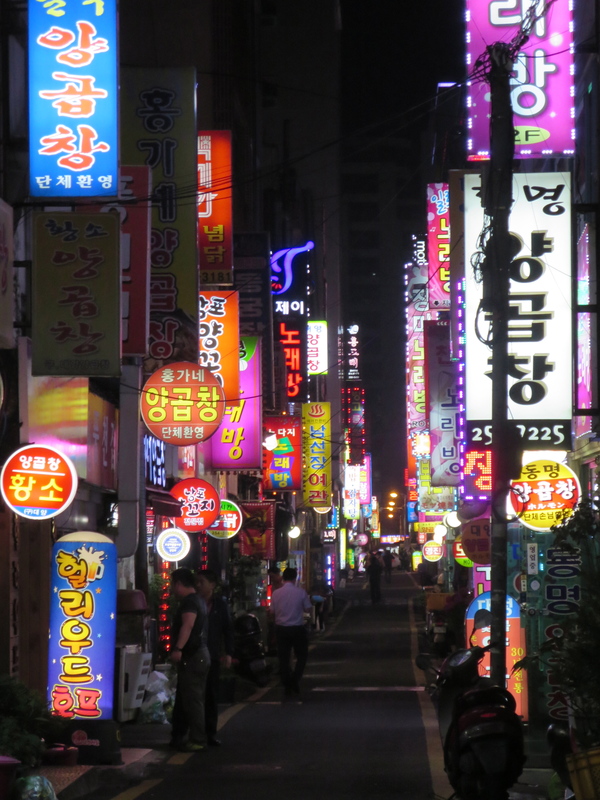 Co-located-by-function is a pattern in many Korean alleys. Also in our block, lining the northernmost alley, is a flotilla of restaurants that all serve grilled fish. Each establishment grills their fish right outside their front doors, further narrowing the passage with charcoal braziers and thick smoke of mackerel. The widest alley in our block is the east end of a beer-and-eats alley that stretches—and I am not jesting here—for six blocks. The people are hardworking, blue-collar, and have their doors open all day long. At noon the local hole-in-the-wall restaurants deliver lunch to the other businesses by carrying laden trays on heads through the alleys. After work, bosses and laborers congregate together at the restaurants, smoking, tossing back beer and soju, and eating whatever is cooked that day. They share the treasure of neighborhood. Even foreigners like us may find treasure in the alleys of Korea. My most significant alley treasure came from one block further east. Returning to the Hotel Nafore, I stumbled into and alley filled with chemistry equipment: store after store of glassware, pipettes, and vacuum separators. These mad-scientist tools stop me in my tracks. “Is there analytical equipment around here?” My curiosity is peaked because I need a very special battery that neither Bangkok nor Kuala Lumpur could deliver. 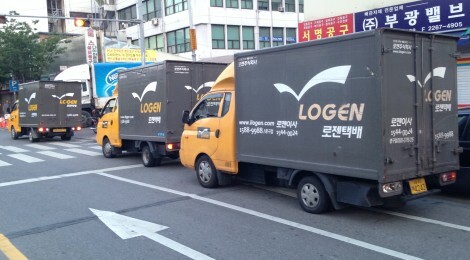 The surprising contents of mercantile in South Korean alleys. On the left are pipettes and on the right is a selection of small analytic equipment. It’s a mouthwatering display for an ex-scientist. Click the photo to enlarge. Three doors down a yellow color catches my eye. It’s the familiar yellow of Fluke, an Everett, Washington company that has made some of the world’s best industrial testing equipment for more than half a century. This shop is clearly a big distributor: they have two doors and a corner space. After committing a couple key phrases to memory, I take a deep breath and open the door. The proprietor is confused. Then quizzical. He studies the battery. “What for?” he says in English. I hold out my USB temperature recorder. He shakes his head sorrowfully. “Near?” I am still optimistic for treasure. I put on a hopeful look and point all the directions of the compass with my cigar-shaped electronic thermometer. He thinks. Then a light comes on in his eyes. He starts giving directions in Korean, then reads my face. He tries in English next, but frustration quickly surfaces on his brow. He looks in the Korean-to-English part of my phrasebook for a few minutes but comes up dry. “Please come,” he says in English and motions me to the door I’d entered through. He locks his shop behind us and then leads us through the alleys. We take two turns and traverse less than 50 meters. 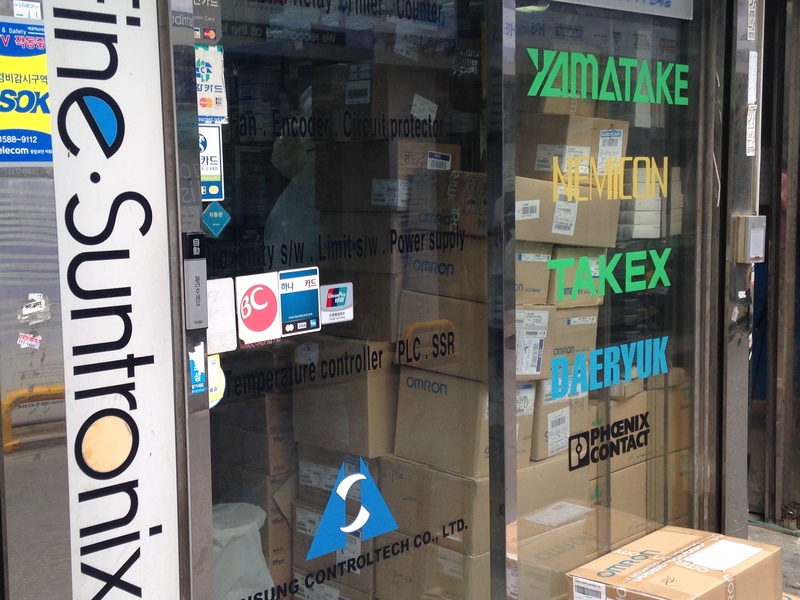 The Fluke distributor’s window in an alley near Jong-ro in Seoul. 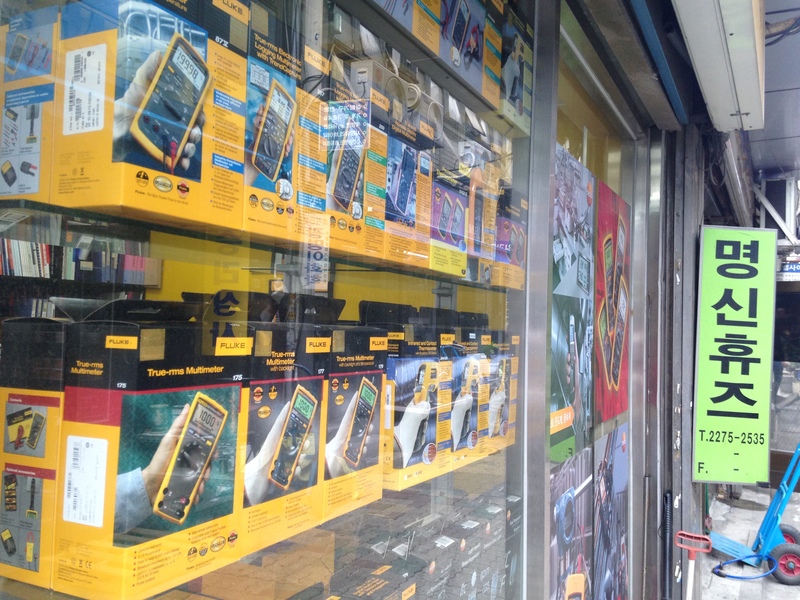 Would you close your shop to help a nearly wordless foreigner find a battery? We stop in front of a glass door bearing a half-dozen company logos with roman characters. “Please,” he says again, motioning for me to step in. The two both nod in unison. My Flue distributor bows. The two bow back. My Fluke distributor retreats, and he is gone before I can offer him thanks. It is the courtesy of the alley. The closest man bends down to look at my hand and the proffered battery. Is that a fleeting smile? He turns back to the desk, picks up a flat crate, and turns back to me. “How many pieces?” His English is thick, but direct and comprehensible. I look down at the box. Here is my treasure! A palette of 3.7V lithium ½ AA cells. There are probably 200 visible, with maybe twenty empty spaces. Clearly they were installing these batteries as a two-man assembly line before we walked in. An unlikely treasure trove. The inside of this distributorship was a crammed as this window suggests. They sold me a single battery that the biggest electronics mall in Malaysia–with eight floors and probably 400 shops in total–could not produce. “One.” I am ashamed that I can’t offer a helpful wholesaler significant business. “One thousand won.” This is a bit less than a dollar. My shame deepens over trading a dollar for treasure that neither Thailand nor Malaysia could deliver. And yet is appears to be the ethic of Korean alleys: be good to everyone nearby. I give him two five-hundred-won coins from my pocket. He looks uncomfortable accepting coins. I thank them as best as I can, then turn corners until I find my way home. I depart with my treasure of Korean alleys.